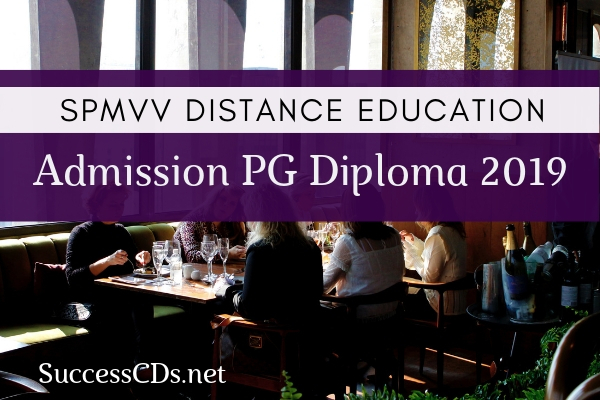 All the details of SPMVV 2019-20 like application process, eligibility criteria and other information are given below on this page. Eligibility: B.A. with 45% and B.Sc. with 50% in groups. They should have studied at least one of the following subjects in their UG course: Economics, Mathematics, Statistics, Accountancy, Computer Science. B. Com/BBA with 45% of the aggregate in groups. B. Tech (Any Branch) with 60% marks on the aggregate. Candidates need to apply to Directorate of Distance Education, Sri Padmavati Mahila Visvavidyalayam from 01st January 2019. Admissions will also be done at study centers. Admitted candidates shall fill their examination application also along with examination fee at the time of admission. For details of courses and prospectus, eligibility, fee structure, application form and list of study centres visit website www.spmvv.ac.in. Last date for admission into all programmes is 01st January 2019. No Admission shall be made after this date. The Prospectus along with the application can be obtained from the undersigned or downloaded from the website www.spmvv.ac.in and the filled-in application form may be submitted along with a crossed demand draft of any Nationalized Bank for Rs.350/- drawn in favour of "The Registrar, Sri Padmavati Mahila Visvavidyalayam, Tirupati," payable at Tirupati.